When it comes to the common theme of Zanpakuto in Bleach, they generally share the same trends, except in certain circumstances. As Byakuya narrated to us, a Zanpakuto is normally expect to generate a large weapon or effect when the Shinigami goes from Shikai to Bankai. The few exceptions to this rule among normal Shinigami are Unohana, Yamamoto, and Ichibei. These three can be called 'exceptions' because they are among the three most powerful Shinigami in the series, and their Bankai do not "expand" the form of their Shikai. Instead, their Bankai can be said to "compress" the power of their Zanpakuto to make their power even more potent. Ichimonji is even more unusual because, given its power over "Names", Shirafude doesn't expand its ability to utilize "Black" - it instead gives Ichibei the power to "Re-Name" whatever he has blotted out with Ichimonji, which is arguably even more dangerous than simply using more "Black". Zangetsu, Sode no Shirayuki, and Nozarashi. We have known about Zangetsu's unique Bankai for over a decade. Even though it was a "fake" Zanpakuto created by Ichigo's Quincy power, Tensa Zangetsu compressed Ichigo's power, rather than expanding it, as most Bankai do. But what makes Tensa Zangetsu different from Zanka no Tachi (from a blazing inferno to a charred blade with all the heat compressed along the edge), and Minazuki (giant manta creature to a blood red blade of acid), is that Tensa Zangetsu transforms Ichigo's Shihakusho and augments his combat speed and physical strength by a considerable degree. Now Ichigo has his "true" Zangetsu. While he has yet to show his Bankai yet (and it is implied that he is not even in Shikai), we saw that Ichigo can use Zangetsu to make himself undergo a Hollow-like transformation. In the past, Ichigo underwent Hollowfication using a Hollow Mask, but now he has used the true Zangetsu to physically transform his body into a likeness akin to the fused Tensa Zangetsu from "Deicide". This is an ability unlike anything we have ever seen before in the entire series, especially from a Shinigami Zanpakuto. It truly shows that Ichigo is more than just a Shinigami - he is also a Hollow, and a Quincy as well. But what struck me the most about Ichigo's transformation is how much his appearance resonates with Zaraki's appearance when Yachiru (should probably say Nozarashi from now on) triggered his Bankai. Aside from breaking the record of the fastest attained Bankai in existence, Nozarashi was a long anticipated Zanpakuto. Not only was it long anticipated, but its power definitely lives up to the one who wields it. But more than that, it also disproved the notion of a constant-release Zanpakuto (propagated by Ichigo's "fake" Zangetsu) because Zaraki does have a release command, and that command transforms Nozarashi from a chipped katana into a massive war-cleaver/axe as almost as big as Zaraki himself. The Bankai is where things get interesting. When Yachiru gives Zaraki the power of Bankai, Nozarashi actually shrinks. It roughly retains its form, but the blade is much smaller, and the tassel and attachment at the top of the blade disappears, leaving it bare. It is much like Tensa Zangetsu in this regard, but the biggest change is Zaraki's overall appearance, because his skin turns completely red, he grows horns and appears to have a black marking in the center of his forehead. But more than that, the increase in Zaraki's physical strength and speed in his Bankai is astronomical, completely overwhelming Gerard, who had previously bested Zaraki when Zaraki had Nozarashi released and had taken off his eye-patch. That said, because of how new it is, his body couldn't handle the overwhelming power it put out, akin to Ichigo over-stressing the bones of his body from over-using the hyper-speed combat of Tensa Zangetsu. This is also akin to how Rukia has to be careful with de-thawing from when she reaches Absolute Zero, lest she damage her own body as well. NOTE: I'm saving this for last because I want to clarify that I don't intend to start any arguments over how the power works. For the purpose of this theory, I won't choose to debate the issue. Depending on how deeply you look into Sode no Shirayuki's ability over the course of the manga, you can see that Kubo has been setting up the reveal about the nature of her Zanpakuto ever since the Aaroniero fight. While it is a Zanpakuto that can use various techniques to freeze Rukia's opponents, the core ability of Sode no Shirayuki instead affects Rukia herself. This is similar to Zaraki's Bankai; this is similar to the transformation Ichigo has undergone in the recent chapter. But in Rukia's case, the effect isn't visible (at least in the Shikai), but it does affect her body. Sode no Shirayuki gives Rukia the ability to manipulate the reishi comprising her entire body, and allows her to continue functioning even when Sode no Shirayuki reduces her body temperature to below zero Celsius, a temperature at which all of her physical bodily functions would cease to function. Not only does her body temperature reduce itself to below zero, but she can manipulate her body temperature to reach all the way down to Absolute Zero. But, akin to Ichigo over-exerting himself in regards to speed with Tensa Zangetsu, and Zaraki's arm ripping off from Nozarashi giving him too much power, Rukia can only stay at Absolute Zero for four seconds, and has to de-thaw slowly in order to not risk injuring herself. Hakka no Togame takes this ability one step further. The sole changes to her Zanpakuto are the ribbon on the handle disappearing, and the blade turning to pure ice. What is most striking, however, is her physical appearance. Like Ichigo's Shihakusho, Rukia's Shihakusho changes into a pure white kimono/robe , and even the leggings of her Shihakusho also turn white (or that could be ice). Moreover, Rukia's hair also turns pure white when she is using Hakka no Togame, and wears a crown of ice. I've heard some people claim that Rukia can't move in this state or else she'll shatter herself; that her physical appearance is purely aesthetic. But we did see Rukia moving immediately after releasing Hakka no Togame (she wound up behind As Nodt when she released in front of him), and the fact that her Shihakusho changes form, just as Ichigo's Tensa Zangetsu did, implies that Hakka no Togame may lend towards a similar fighting style, with the Zanpakuto able to reduce her body temperature all the way down to Absolute Zero being Rukia's version of Zaraki's Oni appearance, and Ichigo's current Hollow appearance. All three of these Zanpakuto and Bankai are completely unique from every other Zanpakuto seen thus far. NOTE: One could count Daiguren reaching maturity and Toshiro aging along with it as a similar kind of Zanpakuto, but I'm banking on Toshiro reaching adulthood being a permanent effect of the Bankai reaching maturity, rather than a special transformation of the Bankai itself. The question that remains is why these three are the ones who have such unique Zanpakuto, and is there anything they have in common with one another that connects them all together. When you look at Zaraki and Ichigo, both of them possess monstrous potential compared to every other character in the series. In that same vein, both of them had something holding all that potential back (Quincy Zangetsu for Ichigo; subconscious shackles on his own power for Zaraki). The two of them were also marked as "Special War Potentials" by Yhwach, so Yhwach was aware of both of their hidden potential long before they themselves were aware. In Ichigo's case, we know why he has such immense potential - his soul is made up of Shinigami and Quincy, and Human and Hollow, a combination which, as finally shown, affords him unique abilities and a Transcendent potential. But in the case of Zaraki, we do not know where he came from. All we know is that he was a child from the Zaraki district, in the most brutal and unlawful part of the Rukongai, who came upon an Asauchi dropped by a dead Shinigami. In the case of Rukia, the ability of Sode no Shirayuki does speak of the potential she also possesses as a character. From my own observations, I came to realize a while back that you can judge a Shinigami's potential based on the power and ability of their Zanpakuto. It is no coincidence that all of the most powerful Shinigami in the series tend to possess the most powerful kinds of Zanpakuto, and the most powerful Bankai, and not many abilities are more dangerous or more powerful than Absolute Zero. But what is unique about her power may point towards exactly why she has such a Zanpakuto to begin with, and why everyone else does as well: the fact that she manipulates the reishi of her own body sounds more akin to a Quincy ability than an ability a normal Shinigami would possess. The basis of the original Tensa Zangetsuwas Ichigo's Quincy power. I am not certain what this means for Zaraki, given he is the only one out of the three whose Shihakusho does not change appearance, but he does get the most drastic physical transformation. NOTE: Oh, and Zaraki's the only one without a mono-color Zanpakuto, though Ichigo may be going the Yin-Yang route. But it is not just Quincy power that may play a factor into the entire issue. If Ichigo is any indication, all four soul types may play a role, because the culmination of all four soul types has been implied to be what produces the power of a God. While some people would be annoyed by this, I see this as fitting with the overall theme of the original three Schutzstaffel so far. While Lille was the only normal Quincy among the trio, all three of them possess the power of a God - Pernida and Gerard are aspects of the Soul King, while Yhwach's Schrift made Lille into one in his Vollstandig. A common theme among these possessors of the power of God is their insane survivability; Pernida's "Progression" allows him to regenerate from being blown apart (only cancerous cells seemingly killed him for good); Lille Barro possesses intangibility, and was able to regenerate into a more powerful form after his head was blown off; "The Miracle" has allowed Gerard to recover from virtually everything the Shinigami have thrown at him, and he keeps on becoming more powerful with each recovery. If there is something that the three of them collectively remind me of as well, it would be Aizen in "Deicide". He fused with the Hogyoku back then, and we saw that inflicting injury upon him after the Chrysalis stage led to Aizen evolving further and further in power in response to the injuries. When Gin "killed" him, he evolved into his Seraph form, attaining a form and power "transcending both Shinigami and Hollow"; when Ichigo struck him, his subsequent anger caused yet another transformation and increase in power. In a sense, Aizen was all three of the Schutzstaffel rolled up into one: regeneration from any injury, no matter how severe (Pernida), the power of teleportation (Lille displayed this in Vollstandig), and he progressively became stronger with each injury he recovered from (Gerard). This is not counting the Hogyoku's ability to "manifest the heart's desire", a very similar trait also shared by Gerard's "The Miracle": everything "The Miracle" has allowed Gerard to do was in response to the emotions of his adversaries. Ichigo also qualifies for this trend, because the moment he attained the power of a Transcendent Being, according to Aizen, was during his fight with Ulquiorra - the fight where he had a hole blown through his chest, and his Hollow power saved his life and transformed him into H2 Ichigo. This is only a possibility, mind you, but this idea of a "God reiryoku" may wind up tying everything together. If Zaraki's appearance now is like that of one of his Zanpakuto spirits (I'm assuming a second one gave Zaraki the name of his Zanpakuto), then it may confirm an idea I just had in regards to these three characters: When these three characters utilize their Zanpakuto, particularly in Bankai, their physical appearance takes on a form akin to their Inner Spirits. The same holds true for Lille, Gerard, and possibly even Aizen. But, instead of simply taking on physical traits similar to their Inner Spirits, the three of them essentially transformed completely into said Inner Spirits. The Light Colossus is this for Gerard; the second Vollstandig form was this for Lille Barro; Aizen's final appearance is what his Inner Spirit would like as a Hollow, with his third form potentially being its appearance in Aizen's Shinigami Inner World. I cannot be entirely sure about Rukia and Zaraki, given we do not know what bloodlines those two came from, but this is definitely the case for Ichigo, as is being proven with his most recent transformation. So there you have my theory on the nature of Ichigo, Rukia, and Zaraki's Bankai: their unique Bankai may be the result of all three of them having a Quincy-Shinigami heritage, and/or having been born into bloodlines or circumstances where all four soul types exist within their souls, and give them the potential to attain the power of a God. I better get back on track with these things. Continuing off from the last chapter, Byakuya assaults Gerard with Ikkasen Jinka, completely obliterating Gerard's head (there isn't even an icy mist left), and losing his head causes Gerard's frozen body to fall apart leaving only his legs intact. Meanwhile, Toshiro is about to collapse from exhaustion from using his Bankai, leaving Byakuya to support his junior Captain. It really does seem that Byakuya is taking the role of a mentor or senior towards his younger companion, and it is a side of him we've rarely seen before. He has shown a stronger relationship with Renji, and we know how much he values Rukia as his sister, but this is one of the few times where we see him interact with a Captain whom he isn't in a polarizing relationship with (said Captain being Zaraki). Either way, it is clear now that Toshiro having been aged into an adult and using the true power of Daiguren Hyorinmaru has taken quite a toll on Toshiro's body, to the extent that he's barely holding it together. ...But miracles do not stop for the weary, as what I was concerned about before the chapter came out comes to fruition: "The Miracle" recreates Gerard's body. Based on the panels, it looks like reishi is being pulled from the surroundings to recreate Gerard's body in a new form, but it could just as easily be the power emanating from Gerard's new form that is falling to the ground. Either way, I was still as surprised as Toshiro by this. Before the chapter came out, I speculated that Byakuya's Ikkasen Jinka wouldn't kill Gerard because he only aimed for Gerard's head, whereas Gerard is the Heart of the Soul King. As a result, I figured that destroying Gerard's heart would be the only way to kill him. However, that seems to be false, because Gerard's body collapsed shortly after Ikkasen Jinka obliterated his head, and Gerard recreated himself FROM HIS LEGS. We know Gerard is the Heart of the Soul King, but I'm almost tempted to think that Gerard took the Soul King's legs with him when the Soul King was dismembered. I suppose that explains how Gerard was able to regenerate from just his legs: freezing and shattering Gerard was a last-ditch effort on Byakuya and Toshiro's part, so there was likely a tangible fear in both of their hearts that it would not work. "The Miracle" took advantage of that, and recreated Gerard as a colossus of light. Frankly, the "Miracle" in this circumstance would be one that would take Gerard down for good. He's gotten so powerful with this power that I'm shocked he hasn't broken the boundary of Transcendence yet. But we can't focus on Gerard right now, because there are other threads of plot to attend to. One of them being Yhwach's dream. Now this is the strangest part of the chapter. In Yhwach's dream, Ichigo is before him and cuts him down, but this is Ichigo as he appeared in the Soul Society arc and the Arrancar Saga when "Quincy Zangetsu" was still posing as his Shinigami powers. Moreover, if you look closely at Yhwach in this sequence, his face is that of his current self, but his hair is as short as it was 1000 years ago, and as short as "Quincy Zangetsu's" hair. On top of that, Yhwach seemed happy he had such a dream, with one of the scariest smiles I've seen in Bleach to date. Given dreams are considered to have some form of symbolism, there are many ways to interpret what we saw. One possibility is that Yhwach dreamed of some form of the future to come. After all, we see a panel that almost exactly mirrors the dream later on in the chapter, but the question is why Yhwach would dream of himself and Ichigo in appearances akin to their younger selves in the present. Another possibility that has been entertained is the idea that Yhwach dreamed of another timeline, an aspect of "The Almighty" not linked to its regular use. How would this be an alternate time-line? Consider, for a moment, if Ichigo had not met Rukia, had not been given Shinigami powers by her. Perhaps, in an alternate time-line, Yhwach was the one who took in Ichigo and was the one to awaken Ichigo's potential, since we know he has a vested interest in Ichigo. Because Yhwach awakening Ichigo's potential would be based on Quincy powers, the appearance Zangetsu takes would be its original form, when "Quincy Zangetsu" was in control. But, as the dream entails, this alternate Ichigo eventually rebelled against Yhwach for killing his mother, and cuts him down in cold blood. But there is a third possibility, and one that I have been concerned about for a while: the dream is symbolic of Ichigo rejecting his Quincy side. That is why Ichigo is seen with his original Zangetsu, and why Yhwach was a mix of his current self and his past self: Yhwach in the dream represents "Quincy Zangetsu", and Ichigo striking Yhwach down is Ichigo subconsciously rejecting his Quincy powers. I say this because Ichigo has not once drawn "Quincy Zangetsu" in battle ever since he cut down the Soul King. He used both Zangetsu against Bambietta's group of Stern Ritter, but he only drew Hollow Zangetsu when attacking Yhwach after he was made to kill the Soul King, when Grimmjow appeared and started picking a fight, when he confronted Askin, and when he came across Uryu. That is four times Ichigo has not drawn Quincy Zangetsu since he killed the Soul King. Ichigo may have claimed that it doesn't matter if Yhwach's blood flows in his veins, but his subconscious refusal to use Quincy Zangetsu points towards him rejecting his Quincy side, and Quincy Zangetsu as a result. It is a really tragic down-turn for Ichigo after "The Blade is Me", and I think that is why Yhwach was so happy at the dream: without Quincy Zangetsu, Ichigo will be completely incapable of fighting evenly with Yhwach. Since it is morning and Yhwach as woken up, "The Almighty" has returned to him and Haschwalth once again possesses his own power. Now, this confuses me a bit. We know Bazz-B commented on night falling when he was confronting Haschwalth, and that was forty chapters ago. Now it is back to day, which means the second night passed while all the battles have taken place. What confuses me is how fast the morning seemed to come (even Yhwach and Haschwalth were surprised it was already morning), especially when Ichigo had only arrived in Soul Society in the early morning of the previous day. Kubo really needs to work on how his time frames work at this moment. Either way, Uryu isn't doing so well, as he's bloodied and bruised while Haschwalth doesn't have a scratch on him. This was to be expected, given Haschwalth had "The Almighty" throughout their fight, but I also suspect that this scene is also a portent of what Ichigo will suffer at the hands of Yhwach. Haschwalth even calls Uryu a beaten animal drenched in blood. But Uryu simply takes it as a compliment, since animals are brave, courageous, and without ill-intent in his mind. Here is where I find something rather curious. Haschwalth claims it was a miscalculation to try to kill Uryu during the night, because Haschwalth's natural ability is more suited to combat than Yhwach's "Almighty", especially against someone (Uryu) he shouldn't be making mistakes against, and prepares an attack that looks eerily similar to Getsuga Juujisho. I say again: Haschwalth says his own power is more suited to combat than "The Almighty". "The Almighty", a precognitive power that allows the user to see the future, "know" every power they "see", make that power their ally, and become unable to be killed or harmed by said abilities, yet Haschwalth's "The Balance" is more suited to combat than it. While the idea is hard to grasp, I can see where it comes from. When Haschwalth's blade was stopped by "The Iron", "The Balance" caused the scales "to tip", and he proceeded to cut straight through "The Iron". The implication is that "The Balance" is an ability that allows Haschwalth to redress any "imbalances" against himself in combat, and tip the scales back in his favor. In other words, a reactive counter/nullification of an opponent's abilities and power. On the other hand, when you look at the above, "The Almighty" is, ironically enough, a defensive ability.Precognition and power immunity are the central elements of "The Almighty"; the ability he used to consume the power of Mimihagi and the Soul King, and his concussive blasts, are extensions of Yhwach's own power, rather than the actual power of the eyes of "The Almighty", even if they are powers he can only use when his eyes are open. So, while Haschwalth and Yhwach are both Quincy with the ability to "share power with others", it appears their unique abilities apparently contrast with one another: "The Almighty" is the ultimate defensive ability, whereas "The Balance" is an offensive ability. While Uryu has most likely been holding something back (he was given the Schrift "A", after all), I have a feeling that "The Balance" may give Uryu more trouble even if he uses whatever his Schrift turns out to be. To end off the chapter, Ichigo and Inoue finally arrive at the doors to Yhwach's throne room, where they sense Yhwach's power from within (yet another point that demonstrates Yhwach is still not at the level of power we saw in "Deicide", IMO). Ichigo says that 2-on-1 would be unfair, so he leaves Inoue in charge of defense and tells her to not let him down. Predictably, Inoue is elated that Ichigo said this to her, as she flash-backs to previous moments in the past, and thinks about how she'll finally be able to fight alongside and protect Ichigo. They open the door, and Yhwach is there waiting for them, calling Ichigo is "child of darkness". As the header for this section should tell, I do not believe that this will go well. Ichigo has already tried to take on Yhwach twice before, and both times he wasn't able to do much to Yhwach. Particularly the second time, since Ichigo actually managed to burn Yhwach's arm with a Getsuga blast the first time they fought, and that was when he was tired from trying to break out of Quilge's "Jail". The second time around, a Getsuga Tenshou from Ichigo's true Zangetsu didn't so much as put a scratch on Yhwach, who at that time possessed "The Almighty". Now, Ichigo hasn't grown stronger than he was in their second confrontation, whereas Yhwach now possesses the power of the Soul King, a power which holds the three worlds together. If Ichigo doesn't draw Quincy Zangetsu when he goes to fight Yhwach in the next chapter, that will confirm what I mentioned earlier, and essentially seal Ichigo's defeat. In regards to Inoue...I am genuinely sorry to say this, but she does not stand a chance in this fight. Not just from an offensive standpoint, but even from the standpoint of defense. Ichigo doesn't know Yhwach's "The Almighty" allows him immunity to any power he has seen and "knows", and Yhwach has already seen Inoue's Rikka (and has likely already seen the rest of the shields in the future). Given what he did to Ichibei's seal after their battle, "The Almighty" likely extends to defensive abilities just as much as offensive abilities. As a result, Yhwach would most likely easily shatter any shields she puts up to protect Ichigo with contemptible ease. Even not considering that, a lot of people I have seen here and elsewhere have seen death flags for Inoue after her reminiscence of the times she couldn't protect and fight alongside Ichigo, or have at least commented that something will happen that will keep her from being able to fight alongside and protect Ichigo. Do I believe that Inoue may die in this battle? While I do understand the impact her dying at this point would have on her friends, I have to say no. No, because this is not the final battle of the series; no, because there are still some loose ends in regards to her character (none of them to do with any theories regarding her being connected to the Soul King, since I don't believe any of those); no, because death would be a mercy in these circumstances. If that was all there was left to her character. We still have that business with the Hogyoku that I'm begging for resolution to (if only Kubo can shut down that line of discussion permanently), and there is at least one other thing I want to see addressed, but I won't get into that in the review. But here is where I say death would be a mercy in this case: because of how powerful Yhwach is and what abilities he possesses, Inoue's resolution to fight alongside and protect Ichigo in battle is likely going to fail. Even if the only thing she can do is heal Ichigo's injuries, she can't do that fast enough in the middle of a fight against someone like Yhwach, and none of her shields would likely be able to deter him in any shape or form, since I doubt he'd allow Inoue the chance to heal Ichigo at all. In other words, Inoue will have to bear the fact that she failed to fight alongside or protect Ichigo in the one moment where Ichigo trusted her specifically to fight alongside him. That is going to hurt a lot more than anything that has happened before. While I fear the occurrence of "The Lust 2.0", I am afraid that may be what happens here. While I can appreciate the fact that Ichigo is more trusting of his Nakama to fight alongside him (a major of his in the Arrancar Saga), this isn't exactly the best of times or opponents to do so. As I said earlier, Uryu couldn't lay a scratch on Haschwalth when the latter possessed "The Almighty"; now that Ichigo is fighting Yhwach himself, who has also absorbed the power of the Soul King, while Ichigo may be subconsciously rejecting his Quincy powers...Things are not going to be pretty. Considering how long I have put this off, I have decided to review these chapters in a different manner from usual by focusing on one set of events at a time, since at least ran through the last fourteen chapters or so. Let us get the shortest of these out of the way, shall we? As many of us suspected, Uryu has not genuinely allied himself with the Vandenreich. Rather, his intent from the beginning was to destroy the Vandenreich from the inside, and he revealed his intentions to destroy the Wahrwelt to Ichigo (after a brief scuffle) by using the same chips that are used in the Sanrei Glove to gather reishi, and then to detonate the chips using his own reiatsu. While he did reveal this to Ichigo and Co., there are a couple of things that I find suspect. The first is the fact that Uryu waited this long, and even 'aided' Yhwach when he was going to absorb Mimihagi and the Soul King. Uryu took a very bold risk by waiting for Yhwach to absorb the Soul King itself before going through with his plan. I imagine that Uryu may be banking on the explosion caused by the Sanrei chips being able to bypass "The Almighty" (since it is not a "power" from a Shinigami, Quincy, Human or Hollow, but a technological device of sorts) and kill Yhwach, but doing so at this time would also warrant the destruction of the power of the Soul King as well. Which brings me to my second point: Uryu gave a Sun Key to Ichigo and Co. so they can return to the Living World through a gate that was prepared for the invasion of the Living World. The Sun Gate to the Living World itself is interesting, because it means that the sequence of Yhwach's invasion places emphasis on the Living World after absorbing the Soul King. It makes me wonder what he intends, aside from reestablishing the Lichtreich. But what about the Shinigami? Virtually every Captain and Vice-Captain of the Gotei 13 is present up in the Wahrwelt at this point in time, meaning that detonating the Sanrei chips would kill not only every Quincy along with Yhwach, but also all of the Shinigami as well. Of course, one could assume that Uryu was telling Ichigo to take the Shinigami through the Sun Gate as well, but that doesn't work because the Gotei 13 want to defeat Yhwach personally, and I doubt they'd trust Uryu enough to take him on his word in this circumstance. So this raises the question of why Uryu was willing to not only destroy the Wahrwelt along with himself, but also the Gotei 13. I don't think Ichigo and Co. realized this aspect of Uryu's plan, but I have a feeling it may be brought up later on. However, Uryu's initial plan fell through and changed because Haschwalth now bears "The Almighty", and was able to "see" virtually all of Uryu's plans and actions, and force a confrontation. Regardless, Uryu realizes what Haschwalth's words and actions mean - right now, Yhwach does not possess "The Almighty", and is vulnerable while he is asleep, so Uryu changes plans - he will hold off Haschwalth while Ichigo and Co. go kill Yhwach (assassinate him in a sense, since Yhwach is asleep). It is at this point we see a potential weakness in "The Almighty" - Haschwalth was not able to 'see' Uryu's change in demeanor when they prepared to fight, and Uryu realizes that Haschwalth may not have fully grasped "The Almighty ability yet. This makes sense, since "The Almighty" is originally Yhwach's power, and the fact that Haschwalth missed "seeing" Uryu's change makes me think that the future which "The Almighty" sees is not one singular future,but all "potential futures", which allows the user of "The Almighty" to guide the future along the path they wish for it to take. However, Haschwalth mentions something rather foreboding - there is no need to pursue Ichigo and Co., because they will perish. Since all the Schutzstaffel have engaged themselves in battle with the Gotei 13 and Urahara's group, this really only leaves two possibilities: either Yhwach will awaken before Ichigo and Co. reach him in time,or there is one or more Stern Ritter left. I say this, because one of the Schrift we have yet to account for is "K". One could say BG9 counts as "K", but he is an automaton, which leaves the question of who built BG9. For that matter, the same person could be the one who devised the Vollstandig in the first place, and the Star Medallion. For one reason or another, Haschwalth is confident that Ichigo and Co. will perish when they come across whoever the last line of defense for Yhwach is, which I feel may be something we'll see very soon. With that out of the way, let us move on to the battle that concluded recently. Askin was always one of the more interesting members among the Stern Ritter, and he certainly did not disappoint in his battle against Urahara and Yoruichi. I will start out by saying that I was actually surprised that Yushiro was as powerful as he was, and demonstrated another variant of the Shunko with an "explosion-based" Shunko. However, I also saw that the boy was dabbling in the same form of arrogance that a number of characters in the manga do: "There's no way I can lose to a mere Shinigami/Quincy/Hollow/Human". Really, this means that both sides of the war are looking down on the other, since both Shinigami and Quincy have said that about the other at one point or another in this war. Regardless, Askin shows why that kind of bravado doesn't bear fruit, as he reveals that "The Death-Dealing" can make him immune to any reiatsu he has taken in, effectively making him immune to the attacks of both Shihouin, and skewering Yushiro after he attempts a futile Shunko. After we cut back to Yoruichi from the above events, we initially see Askin lying on the ground, but the one who is actually beaten is Yoruichi, who got a dose of a reishi-oxygen-nitrogen giftball. At this point, Askin has Yoruichi dead to rights, and she can't even react to him when he has walked right up to her. Ichigo is a War Potential because of his "latent potential". This is no surprise, given exactly how powerful we saw Ichigo become in "Deicide", and his heritage of all four soul types. Should Ichigo tap fully into all of his potential, there is probably no one in the series he could not be stronger than. Unfortunately, on the current ground situation, Ichigo seems to be subconsciously avoiding his Quincy abilities. As I noted before, and I will note again, Ichigo only used one "Zangetsu" when he confronted Uryu. This leads me to believe that what happened with the Soul King affected him just as his Hollow (the true "Zangetsu") did - he is afraid of that side of that himself. Zaraki's "fighting strength" is why he is designated as a War Potential, and this war has definitely shown us why that is the case. While he is beaten out on the "latent potential" front, Nozarashi more than demonstrated that Zaraki is nigh-unmatched when it comes to raw combat power. Even before he learnt Nozarashi's name, Zaraki was the only Shinigami outside of Yamamoto to kill any Stern Ritter (three in his case) in the First Invasion, and he did it all with a sealed Zanpakuto, as we now know. I'll get more into him later, considering his role in recent chapters. The last War Potential to be confirmed was Ichibei Hyosube, and he is marked for his "wisdom". In part, we probably should not have been surprised by this, but we were surprised, because we tend to rely on out-right declarations of certain facts. When you look at his position, it is not hard to see why: not only is Ichibei essentially THE Founding Father of the Soul Society, but he is the Captain of Squad Zero, and knows the names of every Zanpakuto from the moment a Shinigami takes up one of Nimaiya's Asauchi. That is a sort of "omniscience" right there. In a sense, we have already seen this aspect of him have an impact in the war, since not only did he tell Renji the true name of his Bankai, but he is also likely the one who told Rukia the name of Hakka no Togame and, given his situation, probably informed Ichigo of the true name of his Bankai as well. We knew Aizen was on the list for a long time, and now we know why: "Reiatsu". Compared to every other War Potential, Aizen Sousuke was singled out for the power of his "Reiatsu", and that title was well-earned, given he is more powerful than he was before (NOT as powerful as when he was evolving due to Hogyoku, mind you), as he demonstrated clearly when he crushed the torrents of the Soul King's power, cast a Kurohitsugi that fractured the shroud generated by Yhwach and Mimihagi's power, and planned to shoot down the Soul King Palace from Soul Society. The fact he was able to mess with Yhwach's perception of time without a Zanpakuto is also a cause for concern, since what Aizen was assuming when his Zanpakuto started to disappear may have actually happened: he become one with his Zanpakuto while still being made "a normal Shinigami". The last one is Urahara for his unknown "Means". In other words, Urahara is the master strategist that is able to account for any possible scenarios, and prepare accordingly. He has done this throughout the series, and he was definitely a variable that changed the war when he prepared the pills that allowed the Shinigami to regain their Bankai, the Fullbringers to assist Ichigo and Co. and bring Grimmjow and Nel to the Soul King Palace, and the Shihouin Relics to create a Gate for the Gotei 13. Now Urahara is being pit against a Stern Ritter whose ability revolves around adapting to the reiatsu of anyone he fights, and he has his plans to counter that as well. You recall how I mentioned I was annoyed with Yoruichi's demeanor when fighting Askin months back? Well, even after she was injected with the drug to boost her immunity, Yoruichi goes and makes the same mistake Yushiro did, charging at Askin with Shunko sparking, despite the fact that Askin already told her that he had become immune to her reiatsu. Thankfully (but not so for Yoruichi's personal pride), Urahara is not one who really cares about "pride" in these kinds of situations, and knows what needs to be done. Once Yoruichi goes down a second time, Urahara pulls the trigger on a new transformation for Yoruchi. Where to begin? To start off with, Fairy Tail probably desensitized me enough to fan-service that I don't give a damn if Yoruichi's transformation turned her into a Were-Cat with only bands of lightning keeping her from being completely naked. It is either that, or Kubo didn't throw all the fan-service in our faces, and focused more on the action. Urahara tells us that this form is Shunryuu Kokubyou Senki, and he is the one who has to tell us because...Well, being transformed into a Were-Cat has got Yoruichi's tongue. Moreover, we quickly learn why Urahara wanted Yoruichi to use this transformation in the first place - although her behavior and demeanor all change to that of a cat, the "mood" of a cat also has a drastic effect on her power and reiatsu, changing the nature of her reiatsu 48 times per second, meaning Askin's "Death-Dealing" cannot keep up with Yoruichi's new form. The form itself raises a few questions for me, such as how in the world she attained it in the first place. We know she was called a "Were-cat" all the way back in the Turn Back the Pendulum days, so it is likely she possessed this power even back then. But is this a Shihouin Clan secret technique (akin to the techniques that originally made Komamura's Clan werewolves to begin with), or was it a power that Urahara devised and gave to Yoruichi as part of his long line of experiments in strengthening the soul (since he's the only one who can get her attention in this state)? It reminds me a lot of the Komamura Clan, so I hope that some answers are given for this soon. But Askin is not down for the count, and he releases Hasshain - a Vollstandig that encompasses the entire area in a "Gift Ball Deluxe" to poison everyone in the vicinity. Moreover, since he is being cautious about Urahara having any more tricks, he sets up a "Gift Bereich" to close Urahara into the Gift Ball Deluxe. While in Vollstandig, Yoruichi's changing reiatsu cannot affect him anymore (if she could move, that is), because all he has to do is take in all forty-eight different reiatsu for one second to build up an immunity to her completely. This is where the conversation between Urahara and Askin gets interesting - when questioned about his loyalty to Yhwach, Askin confesses that, more than being loyal to Yhwach, Askin is interested in Yhwach. He is interested because Yhwach is attempting something that virtually no one else would dare to attempt: destroy Soul Society, Hueco Mundo and the Living World, and create a new world after those worlds are gone. Askin does not want to miss this chance with Yhwach, and that is why he is loyal: he wants to see what Yhwach will create, and asks if Urahara is the same. In regards to Askin, this makes me wonder about his back-story. He speaks as someone who has seen all the world has to offer, and as someone who has lived a very long time "because he just won't die". That is what he said is the reason why Yhwach took him, but he was quite clear on only Pernida and Gerard having powers before they were recruited into the Stern Ritter, as everyone else had their power awakened by the Schrift. It is really a mystery when it comes to Askin, not to mention his words about Haschwalth being "the next emperor" and how any conflict with Bazz-B would be "poison" for him. On Urahara's part, his response to Askin also makes me wonder what Urahara's end game is going to be. He states that he is not interested in the world that Yhwach wants to create, but it is not, as Tekking101 points out in his review, a classical Shounen hero "you're just twisted and evil" rebuttal. Rather, it is a "no but yes" scenario: Urahara does not want to see what Yhwach will create, and he states that Mayuri wouldn't either, because scientists are people who will create something new that has never been seen before with their own hands. Askin completely agrees with Urahara's answer, even if he still wishes to see what Yhwach will create, and goes on the offensive with the Gift Ring, a ring of reishi that disappears as it approaches the target before piercing the targeted limb or organ (Urahara's eye), and killing it instantly. He is doing it because, according to his own words, Urahara is too troublesome an opponent for him to simply lower the lethal dosage on. Kannon Biraki Benihime Aratame, Urahara's Bankai. Taking the form of a large puppet-woman, Kannon Biraki Benihime Aratame allows Urahara the ability "to restructure anything it has touched" that is within her range. That includes Askin's body, as well as his own, which he used to repair his eyes and physically augment himself in battle, enough to physically overpower Askin in his Vollstandig state. Because Urahara forced a physical confrontation, Askin attempts to counter by heightening the lethal dosage of the Gift Ball Deluxe, because he does not want to directly deal with Urahara's Bankai. However, Urahara has one last trick up his sleeve: he used Kannon Biraki to "restructure" a path into the Gift Ball Deluxe through the Gift Bereich to allow Grimmjow, in his Resurreccion, to come up behind Askin and rip his heart out. Kannon Biraki Benihime Aratame is a frighteningly powerful ability. Even though Askin said the Gift Bereich made it impossible to escape the Gift Ball Deluxe, Urahara realized it wasn't "impenetrable", and he used his Bankai to create a path into and out of the Gift Ball for Grimmjow (and later Nel) to use. That said, Kannon Biraki also reminded me of something else: the techniques that Urahara created for the insertion and extraction of objects from a soul. He used the technique to placed the Hogyoku into Rukia, and Aizen used another one to extract it from Rukia. As we saw, the hole created from Aizen extracting the Hogyoku simply mended itself. Now, I realize, Urahara may have based both technologies on the ability of his own Bankai. We also learn a little bit more about the Resurreccion - along with returning to an Arrancar their original form and power, their reiatsu also changes from that of an Arrancar to a Hollow, a trait which Urahara used to get one over Askin, confessing that it was one of a thousand possible scenarios that he prepared for. As a result, he found the Resurreccion's changing of the reiatsu of an Arrancar "interesting", and "prepared" for it. ...Which causes the Gift Ball Deluxe to increase his power exponentially, because Askin can no longer maintain the locks on it now that he is "dead". The man certainly is talkative for someone who is "dead", even when the Gift Ball is magnifying its power because he "died". I'm almost tempted to think that "Death-Dealing" is like Sode no Shirayuki - "Death-Dealing" allows Askin's body to function even in a state of death by manipulating the reishi of his body. Either way, there is the possibility that he may survive this still, since Neliel, whom Urahara had stationed outside the Gift Ball to extract them if "one of the five possibilities" occurred, noticed that were were four reiatsu still in the Gift Ball Deluxe. Since they moved away from the area where Yushiro was struck down, that leaves the fourth reiatsu as Askin's reiatsu. It is going to take her at least two trips (according to some translations), and she goes to rescue everyone in the Gift Ball, even though she'd prefer to go meet up with Ichigo. But Urahara has something else on his mind as he nears his death due to the intensity of the Gift Ball, the stitches created by Kannon Biraki opening up with blood as his Bankai collapses and de-activates. In what he believed may be his last breaths, he entrusts everything - the future of the world - to two individuals: Kurosaki Ichigo and Kuchiki Rukia. Viz confirms that the "Kuchiki" he is talking about is Rukia (he says Ms. Kuchiki), which is really quite a big deal, and may point towards just how far ahead Urahara has planned everything. He chose Rukia to be the container of the Hogyoku at an unknown point in time for an unknown reason. Given how so many things are coming together in this Final Arc, I sincerely believe that those reasons are going to tie into this Final Arc, and perhaps the Quincy as well. Perhaps Urahara has seen something about Rukia that has escaped the eyes of everyone else, even Yhwach and Aizen. Now we move on to the final part. This battle has been going on in the background for a while, and now it is at the forefront (and may be reaching its conclusion in a few chapters). After Gerard took down everyone else, the Visoreds finally show back up, and the four of them try to tag-team Gerard (using their Masks, no less). Hachigen uses a new Kido, Love uses Tengumaru, and Lisa uses a new Shikai technique while Hiyori distracted him with a Cero. But even with all of them (except Hachigen) augmenting their power with their Hollow Masks, not a scratch has been laid on Gerard, who simply knocks all of them aside with the force of swinging his shield arm. Now, I know a lot of people have wondered why Kensei and Rose (or Shinji, for that matter) did not use their Hollow Masks when they were fighting the Stern Ritter, especially in Bankai. Some people have speculated that a condition for re-joining the Gotei 13 was for them to not use their Hollow Masks, but I think it is something else. Namely, the Visoreds can't use their Bankai and Hollow Masks at the same time. Although they have hybrid powers, using one or the other means they are drawing on only one main source of power, and they can't use both at the same time. It is no different from how the Stern Ritter could not use their Vollstandig whilst in possession of a stolen Bankai. When Gerard attempts to wipe out everything by punching the ground, Toshiro finally appears on the scene and freezes Gerard, and immediately goes to Bankai to fight him. The next time we see Toshiro, half his petals are gone and he hasn't done anything to Gerard in his current state. We see that Gerard didn't completely take down everyone, as a slightly bloodied Byakuya shows up to assist Toshiro...Only for Gerard's attack on the both of them to be interrupted by Zaraki showing up, arm regenerated and legs healed, and slicing Gerard's arm off. It really goes to show how efficient Mayuri's healing tubes are. They even give the healing pods "Resurrection of "F"" a run for their money, since Zaraki must have only been in one of those healing tubes for less than an hour before getting back up on his feet (and beating Ikkaku and Yumichika to Gerard). I would assume that the seventy-two barriers would destroy anything falling down first (though they didn't stop Lille when he fell down as light), or we partly misinterpreted exactly when Ichigo arrived in the Soul Society (closer to one day instead of half a day), and the barrier still has a hole in it from when Ichigo punched his way through it. Yhwach was specific on the 6000 seconds, so that's just under two hours. If it is already night when it was morning when Ichigo arrived, then the barrier should be closed already. Moreover, the speed for something as big as Gerard would have to be moving to wreck Seireitei would be astronomical. NOTE: I checked other translations, and they say Seireitei, not Soul Society. But Zaraki is nonplussed even when Gerard tries to stomp on him, simply grabbing his leg and throwing him aside, and strike to strike at Gerard's head. However, Gerard's shield is sturdy enough to block Zaraki's sword, and Gerard sends him flying, and decides to draw his "Hoffnung" to deal with Zaraki. Since Zaraki couldn't cut through the shield, he responds immediately by taking off his eye-patch, and releasing Nozarashi in one go. The sword release particularly surprises Toshiro, and leads Byakuya to realize that Zaraki never had a "constant-release" Zanpakuto, which further leads him to speculate that the "constant-release" Zanpakuto never existed to begin with. However, even going all out is not enough for Zaraki to over-power Gerard, since Gerard clashes evenly with Zaraki. What is more, chipping Hoffnung with Nozarashi has consequences for Zaraki, because it causes a wound to appear across his body. He explains that "The Miracle" is a power derived from the emotions of those around him - "Fear" caused his body to grow to gigantic size, and Hoffnung is shrouded in "Hope", which causes despair if it were to be chipped or broken. But Zaraki is not dissuaded at all, and continues to go on the offensive against Gerard, the two exchanging banter back and forth with each other as they do. Zaraki is so engrossed in the fight, in fact, that he knocks aside Toshiro when he attempts to help him. Although Zaraki does not listen to reason, Toshiro still wants to help because he realizes that Gerard is not an opponent that not even Zaraki can beat on his own, even with his eye-patch removed. Toshiro is proven correct on this point, because Zaraki becomes weaker and weaker as the fight progresses with each chip in "Hoffnung's" blade, eventually being beaten entirely. This speaks volumes of just how powerful Gerard is in this form, and the strength of Hoffnung - Nozarashi obliterated a Seireitei-razing meteorite and cut through Space itself, yet it can only chip Gerard's blade. Gremmy was monstrously powerful in his own right (to an unusual extent), but Gerard has him completely beat, even able to counter both Toshiro and Byakuya when they try to go for an opening to take him down. By this point, Gerard has definitely proven he is the Heart of the Soul King. Then Yachiru shows up out of nowhere, essentially reveals that she is Zaraki's Zanpakuto, and gives him Bankai. This is very interesting for a number of reasons: this means that Yachiru was manifested in the material world all this time and, rather than Zaraki needing to fight and subjugate his Zanpakuto to attain Bankai, like every other Shinigami, Yachiru instead chose of her own free-will to give Zaraki the power of Bankai, without the need for a fight. As I stated when the chapter initially came out, I am starting to wonder if this is not the proper method for a Shinigami to attain Bankai - not by fighting and subjugating the Zanpakuto, but by having it manifested in the material world for a prolonged period and bonding with his Zanpakuto spirit. Someone suggested that Nimaiya would be completely behind this idea, given that he is the man who created the Asauchi that all Shinigami use to forge their Zanpakuto to begin with. However, I disagree with that idea, because Nimaiya's established idea when Ichigo and Renji were training was "which was superior, Shinigami or Zanpakuto," and that is not what you see with Yachiru and Zaraki. When Ichigo came back from learning about himself, the Asauchi reacted by kneeling before Ichigo. Yachiru does not "kneel" or subordinate herself before Zaraki, and instead enjoys watching him fight, and in chapter 668 pulled his hand up and gave him the power of Bankai to continue fighting. Yachiru is not the "superior" in the relationship, and neither is Zaraki. Yachiru and Zaraki are equals to one another. The Zanpakuto and the Shinigami are one and the same being; the Zanpakuto is the power of the Shinigami, but have their own will separate from the one who wields their power. The two Zangetsu have their own motivations separate from Ichigo's own; Zabimaru withheld the full name of Renji's Bankai because he did not fully acknowledge him yet. But Nimaiya and Ichibei, in a sense, take that authority away from the Zanpakuto. The system of attaining Bankai takes that ability of choice away from the Zanpakuto, in part or in full. Nimaiya made Renji and Ichigo fight the Asauchi until they triumphed over them, or until Ichigo learnt about himself, with that knowledge causing the Asauchi to kneel before Ichigo in subordination. Furthermore, Ichibei told Renji the true name of his Bankai, and told him to manifest Zabimaru and "convince/make" him recognize Renji's power. Did Zabimaru have a say in that at all? No. Ichibei took away Zabimaru's authority over its own Name, and simply gave the Name to Renji, who in turned had already been powered up to such an extent by the Squad Zero training, that Zabimaru may have had no other choice now but to give Renji that power. 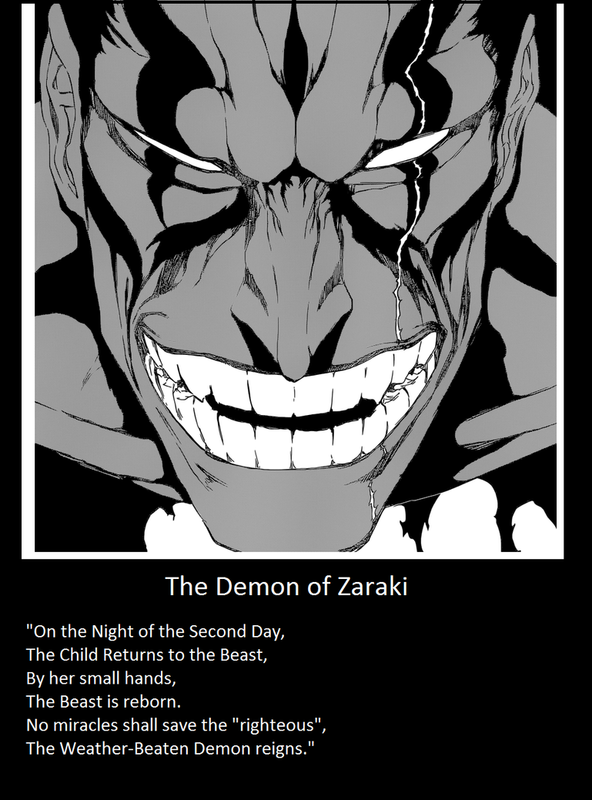 That is not what we are seeing with Nozarashi and Zaraki - Nozarashi chose to give Zaraki his Bankai on her own terms. Assuming that there are two Zanpakuto spirits comprising Nozarashi (the skeletal figure Zaraki is depicted as in volume sketches and his reiatsu), that is likely true for both Nozarashi, since the other would likely need to allow Yachiru to give Zaraki the power of Bankai in the first place. People may complain about how Zaraki has gotten a Bankai just like this, while every other character has had to train and fight their Zanpakuto, but I see this as the natural method of attaining a Bankai, one that is not corrupted by a militarized institution which believes in fighting and subjugating the Zanpakuto Spirit, a part of yourself, in order to attain its power. NOTE: The image is one that I made. Does that look like an ordinary Bankai to you? Most Bankai in the series either expand on the existing ability of the Zanpakuto by generating a large effect, creature, or increase the size of the weapon. Even in cases where this doesn't occur (Yamamoto and Unohana), it is only the Zanpakuto that is transformed. Here, not only did Nozarashi becomes smaller when the Bankai was released, but Zaraki physically transformed into a red-skinned demon with vastly augmented physical strength, able to tear off Gerard's entire arm just by biting his fist and twisting his arm off. On top of that, he carves straight through Gerard's shield and other hand when he goes to strike for Gerard's head, tosses him away off the Wahrwelt with a single hand, and then completely cuts Gerard in half when he attempts to fly back up and destroy Zaraki. It was no joke when Yachiru/Nozarashi said there was no one Zaraki couldn't cut down if he used her properly, as Zaraki completely overwhelmed Gerard with the power of his Bankai. But even cut in half, Gerard is still not done, as his two halves pull themselves back together with reishi, and he is restored in an even more powerful form than before - Aschetonig. It might be his Vollstandig, but we can't be certain with the Heart of the Soul King. With just a (comparatively) small blast of reishi, Gerard blows off one of the sections of the Wahrwelt, with Toshiro barely able to suspend it in place with ice, but just the force of Gerard moving his sword is enough to blow away Toshiro. Unfortunately for Zaraki, it seems even his body (the same one capable of containing the same reiatsu and power that killed Gremmy's body) is not strong enough to handle all of the power of his Bankai, as Yachiru (I'm going to have to settle on one of the two at some point -_-) realizes after the power of his Bankai blows his arm off, leaving him vulnerable to Gerard's strike, cutting off his arm and smashing him into a crater. We see this scene surrounded by black, as if we are seeing a scene that only Zaraki may be aware of. While Toshiro and Byakuya were concerned that Zaraki may be mindless in his Bankai, it seems that Yachiru was actually the one guiding Zaraki in this state, and giving him as much power as she saw fit. Though it seems that she over-estimated how much Zaraki could handle. Gerard then swats Toshiro aside when he realizes he is there, and Byakuya catches Toshiro with Senbonzakura Kageyoshi. Byakuya tells Toshiro to release his Bankai, since he believes Toshiro is at the limits of which he can use his Bankai, because the petals are starting to quickly count down to zero. However, it is not quite how Shawlong (and everyone else) assumed it to be all those years ago, now that Toshiro has completed his Bankai. Now that his Bankai is "complete", when the petals count down to zero, Daiguren Hyorinmaru reaches full maturity. So does Toshiro, since the Bankai reaching full maturity gives Toshiro the Captain Marvel (DC) treatment and ages him up into a young adult. This delights Gerard, since he finds more joy in fighting an adult than in a child, but Daiguren Hyorinmaru's power in its mature state has become monstrously powerful, allowing Toshiro to freeze Gerard's thrown shield in mid-flight, and has made Toshiro powerful enough to cut in half and freeze Hoffnung instantly, completely suspending its "Hope" power. It is clear from this that Daiguren reaching full maturity doesn't simply mean the Bankai has reached full power, but that Toshiro has also had a significant power increase as well, to the point where he is at the stage that Kyoraku claimed Toshiro would reach in a century. It is also a demonstration of the marked difference between a mature and complete Bankai, and a Bankai recently attained. As powerful as the Bankai of Nozarashi is, it put too much strain on Zaraki when he was given too much power too quickly. Toshiro, on the other hand, has had more time to train and eventually "Complete" his Bankai, allowing him to fight at this level, even able to freeze the function of whatever he uses Daiguren against, including the concept of "Hope" itself. It goes to show just how much greater Toshiro's control over ice has become, and he still isn't using Tenso Jurin, from the look of things. Once he pulls Tenso Jurin out, I don't even want to imagine how much stronger that technique has become. Even when Gerard resorts to using a Quincy bow, that is not quite enough, because Toshiro used Shikai Hyouketsu, which is capable of freezing all elements of the world - fire, water, air, earth - to completely freeze Gerard and the bow solid in an instant after four seconds (or four steps, depending on the translation). At this point, it is safe to say that Daiguren Hyorinmaru is still much more powerful than Hakka No Togame. But as I've said elsewhere, Hakka no Togame is a relatively new Bankai, and Rukia has not had the time yet to fully master its power. Once she has more time to train Hakka no Togame, I imagine that the gap between the two Bankai will close once more. But even with Shikai Hyouketsu used on him, Gerard is not quite out for the count, as he is able to break free and grab Toshiro, declaring himself to be a "disciple of God", and that he cannot be bound by the elements of the world. Even if Gerard is the Heart of the Soul King, him and Pernida both make it clear that the aspects of the Soul King have all evolved distinct personalities and identities of their own. If it weren't for Pernida speaking of how it has always been a Quincy, completely distinct from its usual pattern of speech, I would wonder if the aspects of the Soul King even remember that they were once part of the Soul King. That certainly wasn't the case for Mimihagi, though its own behavior may have been influenced by Ukitake being its host. Despite all of that, their powers are still those of the Soul King - the power of a God. Senkei: Senbonzakura Kageyoshi. This time, Byakuya does use all one thousand blades at once (the compressed power of one hundred million of Senbonzakura's blades) as part of Ougi: Ikkasen Jinka, which stream towards Gerard's head in a brilliant display of light. Unfortunately for Byakuya, I doubt that blowing up Gerard's head will kill him. Byakuya already destroyed his head once when Gerard was Human-sized, and Zaraki cut Gerard in half and he still got up. Perhaps Byakuya is aiming for the Quincy Cross that appeared between the two halves of Gerard's head when he pieced himself back together, but Gerard is The Heart of the Soul King, not the Mind of the Soul King (I think that is Gremmy). If you are going to kill Gerard (if the aspects of the Soul King can be killed completely), you are going to have to destroy his body and Heart. Finally, I caught up. Sorry for the long read.